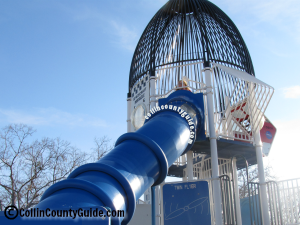 Cities in Collin County have been rated as some of the best to raise a family, so it comes as no surprise that we have some amazing playgrounds and play areas to keep kids busy for hours! When you're ready to venture out from your neighborhood playground, come to these great free areas to let the kids run. 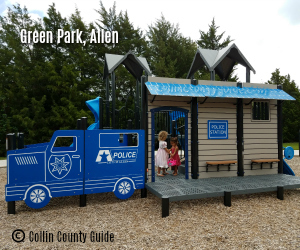 They're are probably well over a hundred parks in Collin County, so our objective is not to list them all here but rather to help you find the ones that the kids will swear you had to pay money to get into--or believe you're the coolest mom in the world to know where all the great spots are found! This park, with a first-responder theme, is located adjacent to a fire station. The "police station" portion is reserved for children 2-5 years, and the larger "fire engine and house" structure is designed for ages 5-12. Bonus: There is a public restroom in the lobby of the fire station. Moms of preschoolers will love this play area because the kids have one way in and one way out. Elementary school children also enjoy this play area. 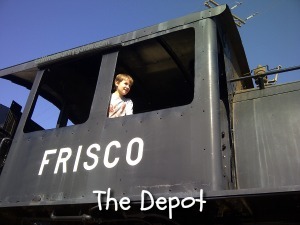 Little play houses, a maze in the shape of Texas, and a real caboose provide hours of fun. Restrooms adjacent. Because this is not a park but a play area nestled inside a shopping area, there are many places to grab a bite to eat. 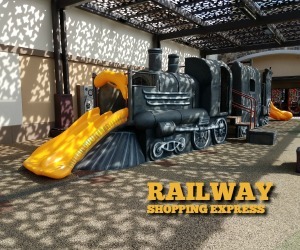 The play area itself is not covered, so when the kids get hot, head across Stacy to the Village Fountain in Fairview Town Center (behind Gloria's Restaurant). 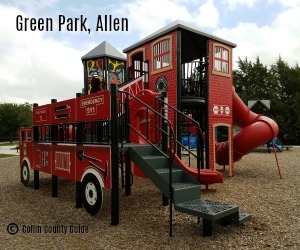 This is one of the best parks for elementary school boys in Allen. The playground is built in the shape of a rocket ship, complete with controls and two slides. Warning: There are open areas at the top of the ship where smaller children may fall through. There is a smaller rocket ship playground for toddlers, but experience is that the little ones will also want to be up at the top of the large ship. A small rocket ship "rider" completes this amazing park. A creek runs behind the playground. No restrooms. 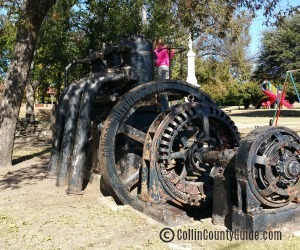 Along with the playground equipment and full-size tractor, the original generator that provided Farmersville with power until 1933 is set up for kids to climb. You'll find this all right next to the historic Onion Shed on Main near downtown. Restrooms available. 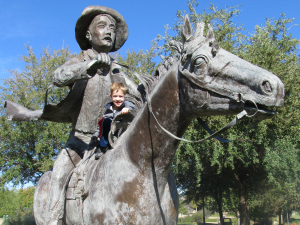 This park is unique in that the "playground" is actually bronze sculptures of over-sized cattle, horses and riders that the kids can climb on. If you're teaching them about Texas history, it's fun to walk the steps and read the quotations of those who drove cattle on the historic Shawnee Trail. There's a small pond and running brook, walking trails and benches. Park on Seei Circle. No restrooms, but close to Stonebriar Mall shopping and restaurants. will love climbing on the train, front porches, and posing along side the jail. For dress-up fun, head inside the museum where the kids can play "Little House on the Prairie" with a small cabin and other props. Our kids had so much fun they didn't want to leave. The climbing boulders geared to young children is what sets this park apart from the other parks in McKinney. Park at the J. Baker Elementary School. There is also a barrier-free play structure. No restrooms. 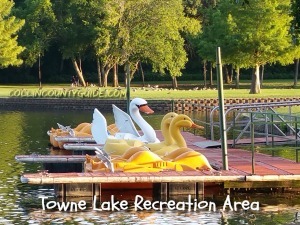 To be honest, we are stretching it by including this under the category of "playgrounds", but would your child enjoy floating around the pond in a duck or swan paddle boat? We thought so! There's also two barrier-free play structures, horse shoe pits, and a fishing pier in the 22-acre lake. What sets this playground apart from the rest? It's SHADED! 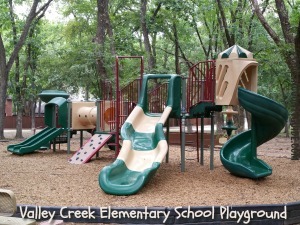 Yes, large shade trees cover an otherwise basic playground, which means the slides, climbing equipment, and benches are not burning hot during Texas' hot summer days. This playground is adjacent to the school. No restrooms (unless the school is in session). 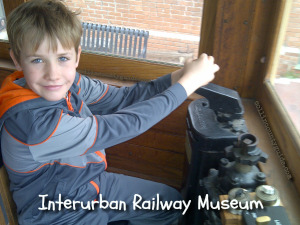 While the playground here is very nice and will keep the kiddos occupied, it is the Interurban Railway Museum located within the park that makes this a special destination. Join a guided tour because the tour guides make a point of allowing the kids to "drive" the car. (Access to the car is only through a guided tour.) Restrooms available inside the museum when open. 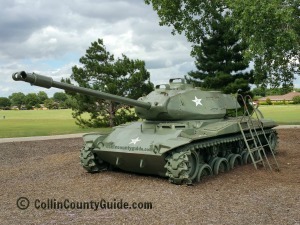 What makes this park super exciting isn't the playground (which is pretty descent), but it is the M41-A3 Walker Bulldog 23.5 ton TANK. Yes, you can climb on it...it even has ladders to help the kids get on top of it! There's also swings and open practice fields. No restrooms. What's more fun for a kid than to climb around inside a giant pirate ship? Pirate Cove Playground is comprised of towers, slides, and lots of areas to climb. The "ship" is at one end of the structure. While the playground is in the center of the park, parking and a shaded area are adjacent to it. For a comprehensive list of city parks, please visit each city's website below.